I hesitate to even write this post, because I am currently eight pounds over my goal weight. 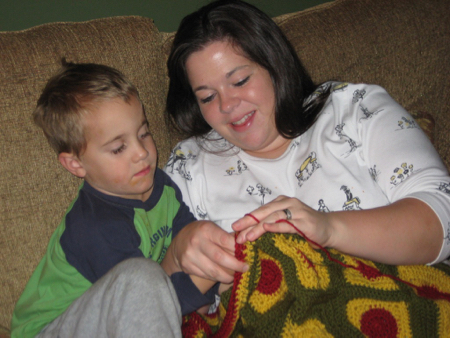 However, in the new year of 2009, I was over 250 pounds, and I haven't seen anywhere near that number since. Depending on how you define success, I've been "successfully" maintaining a weight loss of 100-130 pounds for the last 7 years. My weight has gone up and down by as much as 30 or so pounds through the years, and I've gotten a lot of criticism for that (considering I write about it on the internet). Despite the weight fluctuations, I do still see myself as a successful weight loss story, though. In 2009, I weighed 253 pounds. Today, I weigh 141. Since I started losing weight, I've gone through NINE New Year's Days. Prior to my weight loss, I always had the New Year's Resolution to lose weight. I never got past the first week of January on my new diet--no matter what diet it was. Since then, I have learned a lot about losing, gaining, maintaining, fluctuating weight. I was so tired of always having the same goddamn goal every year, and it's refreshing not to have that redundant "New Year's Resolution" anymore. But I do remember that feeling of hope every January 1st--the feeling that THIS was going to be the time! Anyway, after that very long intro, I thought I'd write a few bits of advice coming from my own experience. First, I always think it's important to recognize that everybody is different. What works for me may not work for you, and vice versa. These are things that I found helpful, but maybe they won't mean anything to you! It's okay. I'm not trying to tell you what to do. Don't make any changes you're not willing to live with for the rest of your life. I've said it a million times, and I still swear by this "rule". If you don't want to run for two hours on the treadmill every day for the rest of your life, then don't do it now. If you don't want to give up dessert for the rest of your life, don't do it now. A friend of mine asked me (way back in 2007-ish) if I would audition for The Biggest Loser with her. I told her no; I didn't want to do that, because working out for eight hours a day while living off of salad and grilled chicken was a miserable way to live. If you've watched the show, you see just how much they work out. And if you follow up with those contestants years later, you can also see that most of them have gained their weight back. I believe that it's because they couldn't maintain that lifestyle forever. I feel like it's common sense that we should do now what we plan to do forever in order to make those changes last. Make the single change that has the largest impact. Chances are, you know what is keeping you from your weight loss goals. Maybe it's snacking from the vending machine all day, eating for emotional reasons, or late night binge eating. Think about whatever habit you have that is the most significant for keeping you from losing the weight. Then make a plan to change that habit. Just that habit! There is no need to change anything else yet. For me, it was the binge eating. I could follow a diet all day long, but then at night, I would eat everything in the pantry. So, I knew that if I could just eliminate the binge eating, I would make a significant impact on my weight. I didn't start exercising, and I didn't eliminate food groups, or anything crazy like that. I just did my best not to binge eat. (Here is a series on binge eating that goes into a lot of detail on how I changed the habit). I measured out my portions and I stuck to it. I hated doing it at times, when all I wanted to do was stuff my face, but I was grateful not to be doing some of the ridiculous diets I'd done in the past: The 6-Week Body Makeover, Slim Fast, and even the Master Cleanse (literally consuming nothing but water with lemon juice, maple syrup, and cayenne pepper for 10 days!). When choosing between a ridiculous fad diet and simply eating less food, it's really a no-brainer. Don't give up when you break one of the "rules" you set for yourself. It's so easy to say, "Well, I already screwed up, so I might as well just wait until next January 1st." Or Monday. Or whenever. Having a clean slate, like on January 1st, is a great thing--until we make a mistake from one of our goals, and then we decide that we'll just have to try again another time. I think that's the biggest problem with New Year's Resolutions... you only get one chance per year to make them right! We ALWAYS make mistakes. It's inevitable. So, my advice is to plan for it and don't let it derail your goals. We get a fresh start every single minute of every single day, so there is no reason we have to wait until the new year. I remember what it was like in the beginning, when I had well over 100 pounds to lose. It's completely overwhelming, and there is a feeling of dread. "Is this really what my life is going to be forever?" 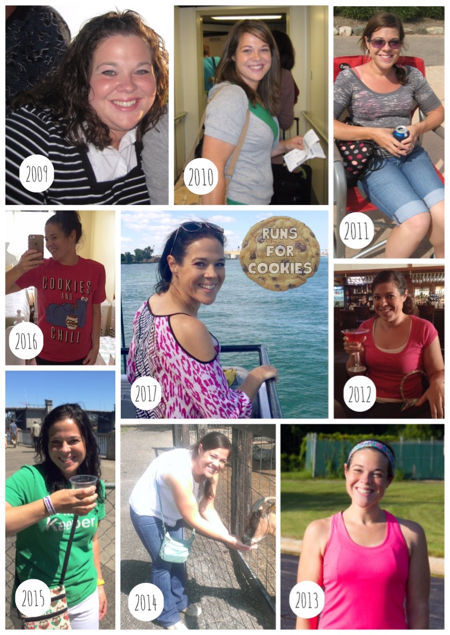 When I started, my first focus was to quit binge eating. And to quit one habit, you have to replace it with an alternative, right? So, I started knitting (and crocheting). Instead of eating in the evenings, I busted out the knitting needles and went to town. I chose complicated patterns so that I would have to focus intently on them. Finding a distraction is the best way to get through the first few weeks or months of changing old habits. Keep things simple. The more complicated our diet or weight loss plans, the more we try to focus on them, and the easier it is to give up. My only goal was to stop binge eating--very simple (not to be confused with "easy")--so I didn't have to remember all sorts of complicated rules. Before I was actually successful at losing the weight, I always made things complicated with a lot of rules. Now, I really believe that focusing on one change at a time is the way to go. Customize your plan for YOUR lifestyle. I prefer to eat on a schedule, for example, rather than just whenever I feel like it. So, I have never done well with "intuitive eating", where you just eat when you're hungry and stop when you're satisfied. There is nothing wrong with eating on a schedule, so if it helps me, then I'm all for it. Don't feel like you have to follow all of the rules of whatever plan you are following. Make it fit into YOUR lifestyle. If you know that you bowl on Tuesday nights with your girlfriends, and you always have a drink or two with them, then just write that into your plan. If that is important to you, then you can keep doing it, regardless of what the "rules" say. When I was losing weight, I wrote my own rules. A lot of popular diet plans suggest such a small amount of food that I could never live on. So, I changed my calorie amount to one that was easier for me. We can write our own rules! Then we just adjust them as needed. The main thing I want to stress on this post is that I know January is usually the time for ambitious diets, and I discourage that. God knows I tried that, year after year after year, and it never worked. It wasn't until I made simple changes that I was willing to do for the rest of my life that I finally made progress. Trying to drastically change our habits all at once is probably the main reason we tend to fail. If we just focus on one change at a time, we'll be much more apt to follow through. When I was finally able to lose the weight, it was because I was consistent and persistent. I stopped switching plans every week (following low-carb one week, then Weight Watchers the next, etc.). I decided what I was WILLING to do for the rest of my life, and I worked that into my lifestyle. I still have lots of times where I "screw up", but that's where the persistency comes in. I just keep on trying. As many times as it takes. Right now, I'm feeling like I'm in a bit of a slump, because the scale is going up. But this is normal for me. For the last eight years, my weight has gone up and down. But I know that if I persist and keep trying, I can reverse the gain, just as I always have. It's still scary to me--wondering if I'll gain back all the weight I lost--but with each week, month, or year that goes by, I feel a little more confident that I won't ever be 253-pound Katie again. Thank you for this! I am starting on my journey in 2018! 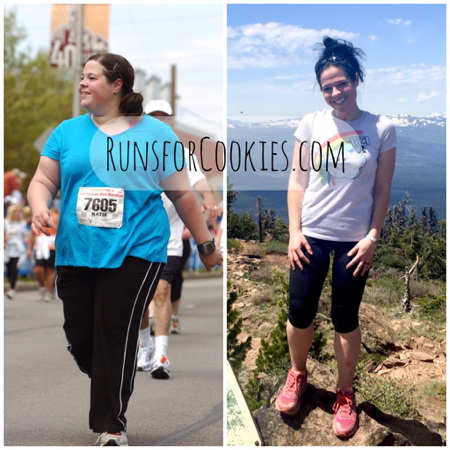 Katie, you are SUCH an inspiration...and seriously, you absolutely should see yourself as a weight loss success story. I can't believe that people have the audacity to criticize. You have accomplished so much, and should be immensely proud of yourself. Thank you for always being candid, and for providing a constant source of motivation and inspiration to your readers. I think you're amazing. Thank you! I needed this more than ever! I am like you were, the binge eating is my biggest challenge. I'm going to reread your series. I never thought about creating a distraction though, I'm going to throw that into my thought process too. You are a weight loss success story, no doubt!!! And-you have helped countless others by writing candidly about your journey. Proud of you girl!!! Yes, such a beautifully written post and so true. I still have a ways to go, but have lost 85 lbs so far and guess what, it's all the things that you have listed (especially persistence) that have made the difference for me this time. I have plateaued hard, literally for months, but I am so proud that I haven't given up or gained. Thank you for all your honest and inspirational posts. I agree with Denise! Katie, your posts are full of insightful thoughts and tried and true methods. Thank you for putting into words what the rest of us struggle to articulate. I've lost 55 pounds since July and it all started by just substituting seltzer water for diet soda. Small changes you can live with...you are spot-on, Katie! You are absolutely a success story! I find you incredibly inspiring and I know many others do too. Repeat after me: You ARE a success at weight loss (and maintaining). Believe that. And know that you are EXTREMELY helpful and appreciated by so many of us on the other side of your screen. I live in Portland OR and look forward to meeting you some day. Keep up the great work. Happy New Year! You truly are inspiring. Such great advice! This is the best post I have ever read from anyone on weight loss. Thank you! You’re so successful- because the ups and downs are real! When I lost the weight in 2013-2015 I knew I would go up and down and it would be normal and ok because you did it and did it successfully and it was normal and I shouldn’t be scared. I wouldn’t have been so successful if I hadn’t had someone to look to or follow who hadn’t been real with their damn anxieties. I am up 9 pounds right now and I am trying to breathe through it and not be scared too. I know it’s hard when we are our own biggest critic sometimes but I wish you could see how much of an huge success we all see you as! You lost an extraordinary amount of weight and opened up your personal life to help others in their own journey. You may not know us but we feel like we know you and we love you for the real, honest, open, inspiration that you are! Thank you! Your weight loss success story (because that's exactly what it is) is inspiring and relatable and REAL and that's what keeps your readers coming back! There is not a human being alive who could maintain the exact same number on the scale day after day. You are amazing and seeing the scale tick up after the holidays isn't a surprise. Mine has done the same and we'll just get back to doing what we know works. I wish you'd post this blog on Sparkpeople. it is one that everyone there needs to read. I love the advice and I love the fact that you're human about it all. So much weight loss advice comes from people who seem to have effortlessly lost a large amount of weight and then kept it off. Yet, reality is much more mess for most people. Great advice for someone who is at the beginning of their journey and wonderful reminders for someone like me who had been there..done that and now doing it again!!! I successfully lost the weight in 2011-12. Give or take 50-60 pounds. Kept it off 4 or 5 years and then let it slowly creep up. And life got crappy and hard and work got insane and I coped with food and coke (classic not the powder). Digging back in after almost getting back to the same starting point. And actually it was your post on DETERMINATION over MOTIVATION that is really sticking in my mind lately. My mom-in-law died this week and I was exhausted and stressed and all I wanted was to swing through a drive thru and get a large coke, but I was determined that I am going to stop drinking empty calories and focus on fueling my body. Thank you for your honest and open thoughts on this never ending battle. Just what I needed to hear today! Thanks for sharing your thoughts and experiences. Sometimes I feel like you are writing my own thoughts! Happy New Year! You are awesome!! I appreciate you continually sharing your story!! Run Your First 5K: 8 Beginner Training Plans!